As you introduce your child to the world of coding using the MicroWorlds EX interface it is helpful to understand the following key areas of the interface. 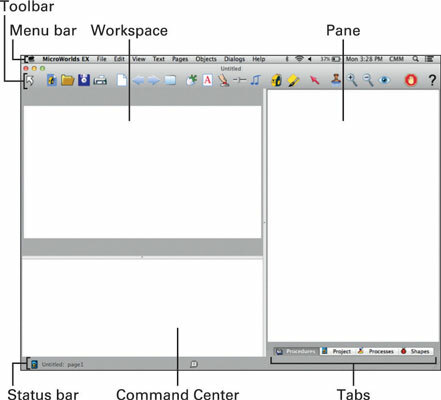 Menu bar: Contains menus for opening and saving files, editing (copying and pasting), changing the view of the interface, formatting text, creating and naming new pages, creating new objects and dialogs, and help. Toolbar: Contains button versions of File items on the menu bar, as seen below. Regular Pointer: As you program, your mouse pointer will sometimes appear as a cursor (in places where you can type), sometimes as a pointer (for dragging a turtle, button, or other element), and sometimes as a hand for placing shapes in the workspace. If the mouse pointer is a hand, you can change it back to a pointer by clicking the Regular Pointer button. Another way to revert to a pointer is simply to click in the Command Center (discussed later in this list). Eye Tool: The Eye Tool button can open a turtle backpack, or a dialog box for a button, text box, slider, or sound. Just click it! This button is also useful for locating hidden objects (turtles) — just click the Eye Tool to reveal their locations. Stop All: This button is useful for stopping program execution. When characters are flying around the screen or the OnTimer function keeps ticking away, click Stop All to halt everything and take a breath. Presentation Mode: Use this button to view your project as an end user would see it. Clicking this button limits the view to the workspace only. Because this mode hides the other areas of the MWEX interface, it allows end users to experience a more polished presentation of your project. Press the Escape key (Esc) to return to the regular MWEX view. This is also how your project will be viewed by people seeing your project posted on the web. Project title and page number: The project title appears at the top of the MWEX interface and also in the lower-left corner. This second location, called the status bar, also shows the page number of the current page within the project. If the page is named, this name appears instead of the default, for example, page1. Workspace: This is where you create the physical appearance of your project. Here, you can add a background and then create turtles, buttons, and other elements of your project. At the start of a new project, you can change the size of the workspace by choosing File→New Project Size, and then selecting one of these options: MicroWorlds Small, MicroWorlds Standard, web Player, Full Screen 640 x 480, or Full Screen 800 x 600. Or you can create a project size of your own dimensions by typing newprojectsize [width height] in the Command Center (discussed next). Note that a project size can be changed only at the start of a project. You can try out a command or snippet of code and instantly see the results. You can issue a command that doesn’t need to be reused (so there’s no purpose in typing it more permanently into a procedure). For example, if you’ve created 50 fish and you want all of them to swim in the same direction, you can command everyone to head in a specific direction and be done with it. You can see any error messages. If MicroWorlds EX encounters a problem with your code, it will tell you in the Command Center. There are other uses for the Command Center that you will discover as you gain experience working in MWEX. Detailed use of each pane will be discussed further in the projects. The divider bars separating the workspace, Command Center, and panes can be moved to increase or decrease your view of each area as needed.